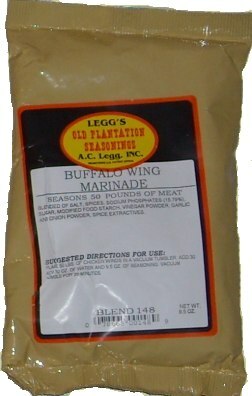 Leggs Old Plantation Buffalo Wing Seasoning. Irresistable hot wing flavor. Marinade wings, bread and fry, smoke, or grill for the best wings ever. Manufacturer recommends 9.5 oz bag and 30 ounces of water to season 50 lbs of wings. Tip: For spicy, full flavored hot wings use this 9.5 ounce bag of seasoning to 25 pounds of cut wings. Mix well, making sure to get the seasoning mix evenly distributed. Pack tightly into a non-reactive pan and let marinade under refrigeration for at least 12 hours but not longer than 18 hours. Forget about the added water. The salt in the seasoning will extract enough moisture from the wings and as the salt penetrates the wing it will pull the moisture along with the flavor of the seasoning mix back into the meat. For smaller amounts use a full teaspoon of seasoning per pound of cut wings and marinade in a sealed zip lock bag with as much air removed as possible.